Ok, so you want to give kids customized hints or feedback based on the mistake they made in solving the problem. Dudes, Moodle to the rescue! Just a little note: my love letters are intended to show you what Moodle can do, now how to do it. Don’t wanna drown you in detail at this point! 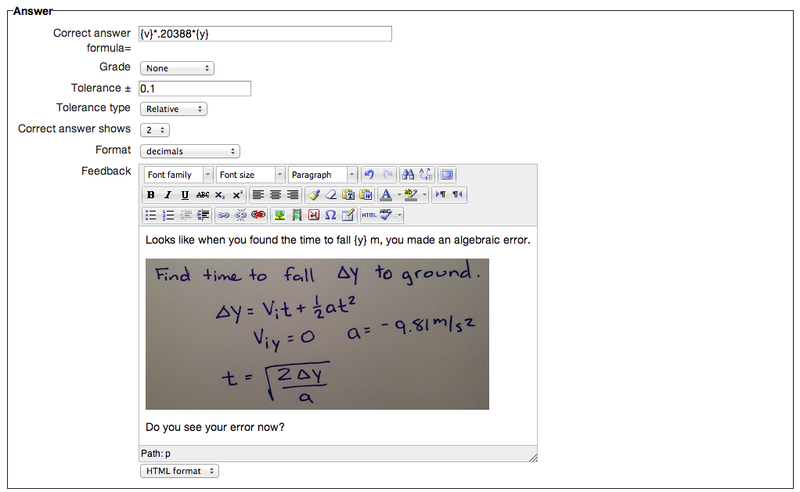 1st: This is the Moodle view your students will see when working a problem set. 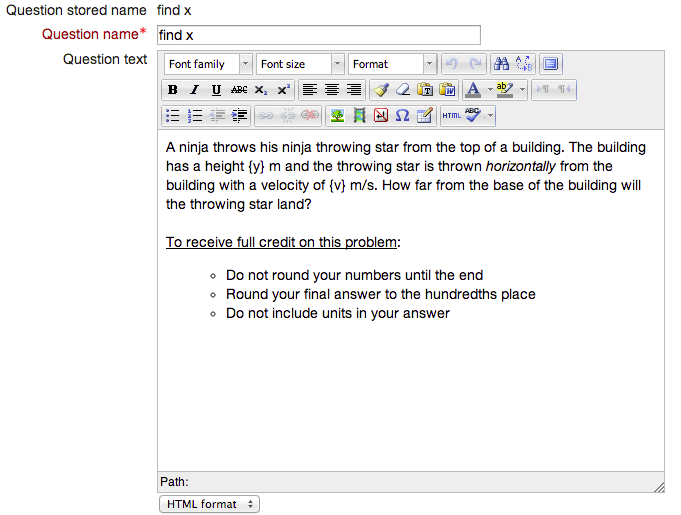 Moodle calls these calculated questions because the software uses variables to calculate answers. You set parameters for those variables and Moodle determines if the student’s answer matches the formula used to calculate the correct answer. Want to know more? Watch a tutorial on how to write calculated questions. 2nd: Student submitted an incorrect answer and gets a full solution as feedback. See how Moodle marked the answer as incorrect then displayed a scanned image I made? Ok, that’s kinda cool. You can provide solutions to your homework problem sets, for example, on a problem-by-problem basis and only after the student tries the question at least once. Yeah, I agree, that’s a little yawn-worthy. I could’ve distributed a PDF of the solutions to every problem if all I wanted was for students to see a correct way to solve the problem. Where’s the beef? I figured you were looking for something a little more…advanced. All right, here’s the scenario: kid makes a silly mistake in solving a problem. Say she forgets to take a square root. She did everything else right. What kind of feedback would you give in person? “Hey, I think you made an algebra error,” is the way I’d go. Let’s do that in Moodle. 1st: Write your question here. Note the variables surrounded by curly braces. They’ll get some details later. 2nd: Define the formula for a correct solution. The syntax is well-documented on Moodle.org. Here’s where it gets interesting. I’ve provided the correct solution above. Now, I may choose to write additional solutions worth anywhere from none to full credit. I’ve written at least one wrong solution below. 3rd: Write feedback for specific wrong answers. Compare the “Correct answer formula” in the 2nd (correct answer) and 3rd (incorrect) pictures here. In this case “Correct answer formula” means the match Moodle is looking for, not the right answer to your problem. You may write as many of these formulas as you like. Note that in the last one, I left out the square root (Moodle treats square roots as raising an expression to the 1/2 power) step. The 3rd picture has a “Grade” of “None” meaning no credit is awarded for this answer. Off topic but worth mentioning — this is how I write my test questions so they automatically and fairly award partial credit. I like to use scanned images of my handwriting because it’s faster to create. You may also use TeX notation. Documenting student mistakes is a huge task — even for those with well-established question banks. To relieve the stress, I add these mistakes after I see students making them. I write out a hint on paper, scan it, and add the mistake to the question in Moodle. Future students (even just 5 minutes in the future) will get the feedback. 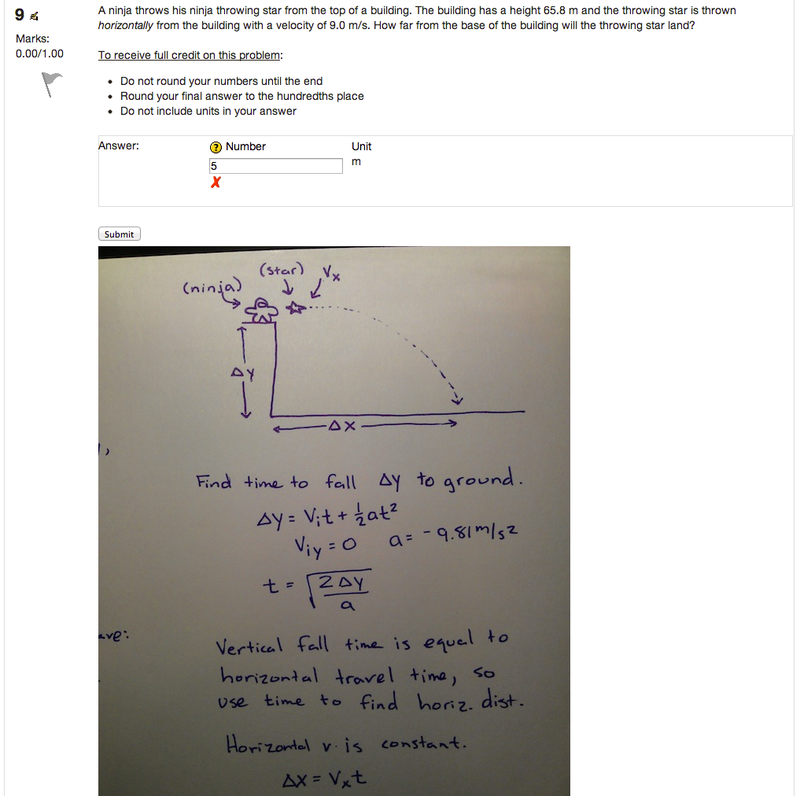 Bottom line: if you can write an algorithm/equation/formula to describe a mistake, you can write targeted feedback in your Moodle questions. So you use Moodle for graded tests too? I love this so much.